Housekeeping Item: Inquiring Minds Want To Know. Click here for the Bio Tab. Note that it is not very full. Please send Petra any details about what it is you do at zmanadmin@gmail.com. I know it's a strange request coming from a guy who goes by Zman however it's not me but your fellow subscribers who want to know. For the most part, I already know who you are and I'm flattered that you're here. Commodity Watch - including gas storage wrap as I was lazy and did not publish it last night. (NBR) - Entered (NBR) September $47.50 calls (NBRIW) for $4 with the stock at $47.30. (CHK) - Wildztrade gone bad. Entered the June $65 calls (again) for $0.94 average. Last bid $0.30. This is why you don't see a lot of WildZ's. (CHK) - Entered (CHK) July $65 calls (CHKGM) for $3.50. Crude Oil: tumbled with the prospect that China would curb demand by boosting gasoline prices. Crude ended down $4.75 per barrel at $131.93. just below conveniently looking round dollar support at $132. This morning oil is trading up $2. the price hikes will prompt local refiners big and small (the so called "teapot refineries") to produce more product increasing demand for crude in the near term. GS notes that following a 10% price rise in November 2007, crude imports increased by 500,000 bopd or about 14%. Morgan Stanley - China Fuel Price Hike Will Not Cut Demand. -Morgan described the hikes as more designed to help financial difficulties of refiners (and it certainly propped shares of (PTR) and (SNP)) rather than as a curb for demand. Natural Gas: softened with crude despite a smaller than expected gas storage injection of 57 Bcf (which came within a hair of the record low for this week in history). Gas fell $0.35 to $12.86 but was well off its low of the day. You don't even start to think of the uptrend in gas prices as being in jeopardy unless you strike through $12.50 and then quickly through $12. This morning gas is trading slightly with crude. 57 Bcf, More Like July Than June. Soaring cooling degree days last week and continued swooning imports yielded an injection that is more typically seen in mid July than June and exacerbates an already questionable storage rebuild season. The following table shows typical rebuilds and max and min rebuilds from this point in the season to the end of injections. The 1 Bcfgpd line is thrown in to show the potential for net additional supply (that's Lower 48 production up 5 Bcfgpd, imports down 3, and exports to Mexico up 1 YoY which are round numbers but may prove not far off for the season unless gas gets north of $15 soon attracting more LNG) to help rebuild storage. Short Position Still SIZE and Got To Be More Worried Than Ever As Storage Comps Toughen. The spec net short position was at record levels last week and the trends in storage data are setting more of the same short, cover and re short action we've seen all year. One Last Chart For The Road. 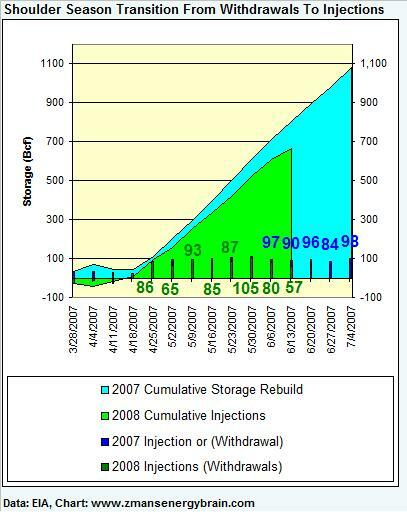 Note the change in slope of the green wedge (2008 cumulative injections); that's not what the bears want to see. (RIG) 5 Year Ultra Deep Capable Contract Exceeds $1 Billion. $1.06 billion to be exact for the GSF Development Driller II to (BP). The raw math works out to a $580,000 day rate proving that recent cherry picked high rates are not flukes and that we can expect to see more contracts for 7,500 foot water depth capable semi-subs in this new $550,000 to $600,000 per day range in the near future. this rig is currently under contract to BP at $208,000 per day and was set to come off contract in November so look for a small bump in EPS '09 and '10 as this extension is probably higher than most analysts were guessing as most rigs in this class have been coming in mid $400s to low $500s on 3 to 5 year extensions. Analyst Watch: Broadpoint ups (NFX) pt from $80 to $88, UBS ups (ECA) from $120 to $130. Honduras Watch: Not to beat a dead horse but some of you don't read every day and so that you don't keep just refreshing your screens in vain next week for a new post know that their won't be one. Comments will be open on the weekly wrap page but I will not post, comment, or likely be aware of the price of oil, natural gas or the stocks next week. This entry was posted on Friday, June 20th, 2008 at 7:29 am	and is filed under Uncategorized. You can follow any responses to this entry through the RSS 2.0 feed. You can leave a response, or trackback from your own site. LONDON — ICE Brent crude oil futures surged higher in London Friday as traders leapt at the chance to buy back in to the market after reasoning Thursday’s sell-off on China’s fuel price rise was overdone. “Crude futures were firmer this morning,” said Andrey Kryuchenkov, analyst at Sucden Research, “recovering from heavy losses Thursday with some investors seizing an opportunity to buy at dips, as the long-run uptrend in oil remains intact,” adding that early dollar weakening also helped leant support. At 1153 GMT, the front-month August Brent contract on London’s ICE futures exchange was up $2.37 at $134.37 a barrel. The front-month July contract on the New York Mercantile Exchange was trading $2.21 higher at $134.14 a barrel ahead of contract expiry. The ICE’s gasoil contract for July delivery was up $7.75 at $122.650 a metric ton, while Nymex gasoline for July delivery was up 448 points at 339.74 cents a gallon. Anxiety over perceived tightening global supply means the flow of oil from Nigeria is a major concern for the market and traders are watching for any news on the outcome of labor negotiations between Chevron Corp. (CVX) and oil workers union Pengassan, over fears of industrial action. News Thursday that a group of militants had successfully attacked Shell’s only deepwater offshore rig, shutting-in 225,000 barrels a day of production, also sent shivers through the market and continues to lend support. Earlier Friday, the Nigerian oil minister said he was confident production would be restored within days. Meanwhile the focus is on the oil summit between the world’s leading producers and consumers in Jeddah, Saudi Arabia this Sunday. Organization of Petroleum Exporting Countries member Venezuela, which firmly opposes greater output as it seeks to maximize earnings, said overnight that it had decided against sending a delegation to Jeddah. Asia woke up to find out China had increased domestic gasoline and diesel prices by 17%-18% overnight, in response to criticism of its fuel subsidies and high oil prices. Oil prices closed lower in the U.S in direct response Thursday marking the largest one-day decline since March 31; the July “08 contract closed down $4.75 at $131.93, a drop of more than 3%. In market economies, consumers are driving less, and in subsidized economies, governments are reducing price protection by gradually lifting subsidies. China follows similar moves by India, Indonesia, Malaysia and Sri Lanka. Any attempts to push prices higher increases the risk of demand destruction and will make the longs “a bit more nervous and shorts a bit more confident,” according to Jakob. Presse Service news agency reported. Jeddah of oil producers and consumers to discuss record high prices. Tenneco moving up in premarket on rumors US will limit imports of iported OCTG [Driling Pipe], this outcome seems unlikely in view of just concluded US/China bilaterals. Z CHK just updated their investor presentation for June 08. Slide 25 shows their NAV @ 164.64 with $13 NG. @ $12 NG it is $146.11 @ $11 it is 129.22. The strip last night was 11.29. These are ALL as of 3/31/08. Nothing about Haynesville in these numbers. All Eyes On Jeddah – Will Saudis Pump More? NEW YORK — For consumers, will oil prices look better after Jeddah? The answer largely will rest on how much new oil Saudi Arabia will bring to market and how soon. After talk a week ago of a dramatic production boost to 10 million barrels a day — the most in 27 years — stoked-up enthusiasm is cooling about whether the numbers can add up. At 9.45 million barrels a day now, after a 300,000-barrel-a-day June rise to meet U.S. customer demand, the Saudis on Thursday shot down a statement on their U.K. embassy Web site that they’re boosting output by a further 200,000 barrels a day. After talks in the kingdom last week, U.N. Secretary General Ban Ki-moon said Oil Minister Ali Naimi told him Saudi output would be 9.7 million barrels a day in July — a level that would be the most since 1981. As the issue remains muddled, and potentially still unresolved internally ahead of a producer-consumer dialogue hastily called by King Abdullah for Sunday in Jeddah, talk has steered away from output rises. A White House spokesman twice this week dimmed hopes for an increase in output emerging from the meeting, where the energy secretary will represent the U.S.
David Kirsch, head of the market intelligence service at PFC Energy in Washington, said the Jeddah “meeting is not about production increases.” But the initial talk of a dramatic boost, if not delivered, could backfire on the kingdom. “If they don’t announce an increase to 10 million barrels a day, you’ll have a chorus of “peak oil” theorists saying they can’t hit 10 million barrels a day,” Kirsch said, referring to analysts who subscribe to the view that global output has reached its peak and is in decline. What Will Flow — Words Or Barrels? Kirsch said the Saudis want to focus on medium- and long-term issues facing the industry, such as lack of investment in oil exploration and production, and refining and the increasing role of financial players in the market. What’s emerging in the run up to the meeting is a laundry list of steps taken by consumer countries, which may well form a stitched-together blueprint for a communique. But assembling a courtroom dossier of reasons why prices should come down isn’t likely to cut it with the market. Barrels, not words, will put pressure on the market. The Saudis must weigh any move with the risk of breaching confidence with fellow members of the Organization of Petroleum Exporting Countries, should they overtly announce an output rise in a consumer-dialogue context. Price hawk Iran, OPEC’s second-biggest producer after the Saudis, said any output changes should be considered only in an OPEC meeting, set for Sept. 9. Venezuela says it won’t attend the Jeddah talks. Both countries, which can’t increase output, would view an unilateral output rise as a direct blow to their oil revenues. Still, it’s significant that the words coming from consumer countries ahead of the meeting seem targeted to assuage some concerns voiced by the producer countries. With the Saudis and others in OPEC joining a chorus in Congress complaining of the impact of speculation on inflating oil prices, U.S. federal regulators are moving to tighten rules. On Wednesday, President George W. Bush called for an end to the moratorium on offshore drilling that’s been in place since 1981. If that were to happen, the oil wouldn’t flow for years, but the move signals to producer countries a long-term commitment to future oil use at a time when renewable fuels are stealing the spotlight. China on Thursday ordered a surprise 17% to 18% rise in retail fuel prices, which the industrialized nations viewed as a step in the right direction toward bringing prices closer to market levels. Rampant oil demand growth from China, where prices are below international market levels still, has helped triple global oil prices in the past four years. The move may end up being all things to all people, blessed by producer and consumer countries alike. For China, the price increase takes the pressure off refiners hurt by poor margins amid soaring crude prices. Analysts say it will encourage refiners to step up processing and crank out more products to alleviate shortages that have sprung up and also burnish China’s image during the Olympics in August. Economics 101 would argue that higher prices will cut back demand, but those rules don’t necessarily apply in the complex Chinese market, analysts said. Strong pent-up demand among China’s emerging middle-class means that additional oil will be snapped up quickly, despite the higher cost. Subsidies to farmers, fishermen and forestry workers also limit any potential drop in demand from higher prices, analysts said. Chinese refineries may need more crude and more heavy fuel oil to crank up operations and still-strong diesel demand (despite the price rise) will continue to pull in distillate fuel from around the world, with perhaps only marginal declines in imports, underpinning prices. Eduardo Lopez, senior global oil demand analyst at the International Energy Agency, said the West’s energy watchdog isn’t lowering its assessment of Chinese oil demand for 2008 after the price hike. IEA said June 10 it expects China’s oil demand to rise by 500,000 barrels a day, or 6.7%, to 8 million barrels a day this year, accounting for the majority of a global increase of 800,000 barrels a day. Widespread comment Thursday was that the price hikes wouldn’t slow the Chinese juggernaut, yet oil futures prices were pounded down, led by heating oil — a proxy for the highly desired diesel fuel — in a selloff attributed to the move. Nymex heating oil futures shed 3.8%, or 14.65 cents a gallon, in the biggest fall since April 1, to $3.7135 a gallon. Gasoline futures lost 11.41c to $3.3526 a gallon, the lowest level since June 10. July delivery crude oil futures — one day before expiration at Friday’s settlement — fell $4.75 a barrel, or 3.5%, to $131.93 a barrel. The drop may have been accelerated by expiration-related trading, but, in any case, prices are down more than $7, or nearly 5%, the intra-day peak of $139.12 a barrel on June 6. A $10.75 price jump that day caused the king to call the Jeddah talks. How clearly the king defines the near-term Saudi oil policy — specifically output and pricing policies and targets — to the assembly along the Red Sea and the waiting world will determine whether the long rally in oil prices is finished, or just preparing to ratchet higher. Z PS CHK over the last 5 years has traded at a discount to NAV of 65 – 75%. Now that it is 50%, it seems Aubrey’s prediction of increasing NAV by 40%/yr is no BS. Morning all. Saudi’s already seem to be setting up to disappoint with the rhetoric. Market looks like they are gonna try and force their hand with yet another big move up today. Nothing to say we won’t be at 140 by the close by the looks of things. Broader market already looks in big trouble. Support is very firm at 1324 – 26. “morning surprise” yesterday after poorly trading my largest holding NBR, I quit looking at the mkt at 3:45, and prepared to go watch the RAYS complete their sweep of the CUBS. at about 1:00 i entered a GTC order to sell my remaining IOC at 36, after reading the Changewatch article someone (who i really am happy with) posted here about putting your stks with a GTC order so short sellers couldn;t use them. i wake up this morn to find out my order was executed at 41.62. it looks like IOC is going to open around 33 this morn. what in the hell happened??? it’s all good!!!! maybe sam or z or anyone can explain to me!!! TS re cuts to OCTG imports, yeah , I doubt that too, talk about shooting yourself in the foot. Kyle – lot of strange trading in IOC last night, did not see any news. Sambone- Thanks for flagging new ETNs…beware of any that have quirky liquidation triggers like DCR did. An Israeli air force drill which appeared to be a rehearsal for a potential attack on Iran’s nuclear facilities was intended as a deliberate flexing of muscles, military officials said today. “This was a dress rehearsal, and the Iranians should read the script before they continue with their programme for nuclear weapons. If diplomacy does not yield results, Israel will take military steps to halt Tehran’s production of bomb-grade uranium,” the official said. Nicky – Dollar falling off again, seeing stories on mkt watch saying no interest rate hikes through fall from Ben. K – No news on IOC. Hey if you got 41.62, take it and run. Watching CHK bid up pre open. Beware pinning action today. D – Here ya go on IRAN, 6-7$ gallon of gas. Z – very little chance of Bernanke doing anything with the market at these levels. All three JUNES right below strike – need a major catalyst. Nice NFX bounce, just sold the calls added at close yesterday. Nicky – agreed, he continues to be hamstrung by need for growth vs obvious inflationary pressures. Hear ya Ram – CHK may already be getting pinned. NG- 57 BCF input Low numbers especially considering Independence Hub increased by 7 BCF per week. ZMAN – About what time will JUN options zero when they are slightly under strike – 1:00 EST maybe? Z – a bit of Goldman follow thru today? Ram – it’ll depend on the IV. The higher it is the later they go 0 bid. I plan to punt the wft in minutes, the CHK at any time. SLB and HAL will go today too but just for cash/trip raising purposes. Dman – did you see the part in the post re their thoughts on China. This up on oil is due largely to that and others saying same thing. Z – #28 yes & I was intrigued by those “teapot refineries”. Kinda curious about those. At least they aren’t using “mud refineries” a la Indonesia. The reason I have asked a few questions about how much swing Goldman has is just that I find it amazing that funds would sit around waiting for GS to tell them what to do. But realistically I know plenty of money is indeed run that way and GS is about the last major house standing in the general credibility department. But I find it hard to guess at just how big a swing they have & I gather you are saying “pretty big”. Salvaged yesterday’s ZMANWILDTRADE for $.85 in @$.50. funny Scoop, just came half out at $0.85 as well. Never doubt the vision of Nicky’s oil price calls. Oil up $4.30 and still climbing. ZTRADE: Out June WFT for $0.50, down 76%. Still holding the August 47.50s. Half out CHK June $65s at $0.85. ZTRADE: Out HAL July $50 Calls for $2.49, up 42% since entry mid April. oil field in Nigeria will remain in place for June and July. who work at the offshore facility to agree when they will return to work. over the impact of an international oil summit in Saudi Arabia this weekend. Nymex crude was up $3.22, or 2.4%, to $135.82 a barrel. August Brent crude on the ICE futures exchange rose $3.08 to $135.08 a barrel. Hormuz, a crucial conduit for the export of Gulf crude. decision to raise the domestic price of gasoline by 17% and diesel by 18%. result in a production boost. least 200,000 barrels a day after the meeting. Thanks Sam, they still have not said if there is damage as well. Refiners still not catching a break. And once again I can say that sometimes the best trade you make is the one you don’t. I wouldn’t short em as they are cheap and a sellside guy from a big house could pop them on you. On the flipside, I’d like to see better numbers from the EIA and wait until July to enter to clear fund window dressing. I specifically watch Fox biz news this morning to catch Flynn, (short oil since $97) and he was playing up the demand destruction angle. ZMAN – Are you still holding the JUN HK’s? UOP – From yesterday on PBR post. If RIG drops I’m all over it. Just a wild thought, any catalyst out of corn flooding to push refiners toward a lower utilization to retool for less ethanol blending (lack of supply), or at least to use as an excuse? Tater – I don’t think so but that hurts my head to think through. Ram – You can always check the WIKI tab to see holdings, I make an effort to update that every night, if the date at the top doesn’t have yesterday or today on it drop me a note. MEND said a couple of days ago it will start going after the tankers. Ok, but that’s why I leave all the thinking to you guys, gives me a headache. I’ll just stick to the math part. Have reason to suspect PQ being pinned at just below 25. On A hunch, just sold PQ June 25 Naked Puts for .10 with no bids and it was immediately taken………….don’t you just love a free & open market market. crys – you are probably right. This is the one day a month where manipulation is the name of the game. pinning setting in the group over. Like watching paint dry. Going to pack. Will keep one eye on the CHK tick chart. tater: refiners are required to us 9 b/gal this year. they finished last year using roughly 7 b/gal and had 2 b/gal worth of credits. An incremental 1.5 b/gal have come on line this year, so even 1.5 b/gal coming off-line wouldn’t really impact refiners. In addition ethanol is very difficult to blend in the summertime due to high vapor pressure, so this is the time of least demand. Friday, though it denied its personnel were involved. Emancipation of the Niger Delta. Despite repeated requests, Chevron officials were unavailable to comment. someone else is using the pseudonym to continue communicating with the press. Looking for signs that the market is trying to make a short term low. Breadth is diverging but volume has yet to do so….the low could come anytime between today and Tuesday and then we are likely to see a short term bounce into the 27th – 30th June. Z – I’m trying to decide b/t the NFX Sept. $75 or $80 calls. Which would you prefer to own base on today’s prices prices and near term potential catalysts? And, is it a bad idea to open a position on an expiration day? Z – FYI, you look good for your trip next week. GOM/Atlantic looks to be quiet so far next week. Z or all – What brokerages do you use, are any particularly good at displaying useful info on options? I go through Scottrade and it’s not super options friendly, of course I can’t really compare it with another broker…. italyinvestor, I use ThinkorSwim and Interactive Brokers. Both are excellent. IB has best commission rates in the biz. Thinkorswim is better for option spreading with nice software. Z, PQ any reason its lagging the group today ? italy i switched most of my acct to fidelity cause they let u short naked options. kept a little at scottrade cause i like their trading platform, altho its easy to make a mistake there, while fidelity gives u a preview. David – you’re asking a bit out of the stock on the $80s and since I don’t know what happens with the Saudi’s over the weekend if I were to place the trade I’d wait through the weekend. One fun little anomaly about expiry Friday’s is that in thinner traded names you often see greater bid support in the next month out. That evaporates Monday if the stock trades flat so all things being equal, it’s generally better to wait. I only see that on the next month out options (which are becoming the new front month) and not the longer dated ones. Italy – I like SSP from Schwab and Optionexpress. I use Fidelity and it is good for stocks and a preview, its charts and prices on options is somewhat limited. The new Active Trader Pro has very limited charts, mostly of 2 months with no recent charts. I like charts and recent option prices and Fidelity is lacking in that regard. Security is great and classes (free and food) are usually helpful but sure could use more option pricing history and stuff like that. Their option trader pro is good also but again no history. IS IT TIME TO HAVE FUN WITH THE JUN 65 CHK calls, YET? P.S. – I haven’t touted VMC for a while. Look at it in the low 60s. Plot the VIX against it. Get the VIX below 20 and this stock should be 80+… and what a great hold! 18 months from now you’ll be glad to have it. Kingdom to give more info on output policy Sat/Sun. Here’s a link giving pros and cons to VMC after it rose to 84 two weeks ago. The bull case is still in place… Basically, inelastic demand and good market areas: those who need rock, need rock and have to pay for it. averaged 2.86 million barrels a day, down 9.3% from the like 2007 period. 1.46 million barrels a day, down 17.3% from the like 2007 period. also affected exports, although higher oil prices have boosted export revenue. Hey Quarry – I’ve had my fill of fun with that one for now, just looking for a graceful exit on the rest. VMC – was the run to $85 due to the China quake? Hi Z – Considering adding to PQ common position today as pinning action keeping the name artificially low. Does this theory make sense or am I off base here? Common I like there as I’m holding. Today, next week can’t say but it is cheap and, market and commodities willing, should be higher. Going to kill my remaining CHK Junes and my deep in the money HK’s as I raise a little more cash. Out remaining CHK June $65s for $0.15 yielding an average sale of $0.50, down 47% since yesterday’s entry. Out HK September $20 Calls for $19, up 132%. Continuing to hold the common and the September $40s. ioc- big run yesterday the result of a short margin call- not met and forced by broker. Thanks Sam # 72 News last night says the price of gasoline running $2.50 to $2.75 pg in Mexico. Lots of folks making the trip to save $$$. How do you find that out? Or is the spec? I’m long IOC options. I’ve been burned by the RJ analyst before. I remember when they had a PPS over $40 on BRNC. ” short ” candidate. Buying July puts. A – here’s wishing you luck, that is my least favorite coal for no good reason other than their history. Uop – thanks much, back late Sunday night so first post should be 6/30. GM, Chrysler and Ford put on negative watch by S & P.
Next support on spx is 1316. The only hope I can see for the broader market is oil coming off at the moment. They are going to need to find some good news to throw at this market this afternoon or we could have armageddon on Monday morning. God Speed and Good Luck Mon Capitan! N – Bhawhahahahah, nothing will happen on Monday. Some talking bubblehead will come on CNBS and talk about how eveything is AOK. To be serious – Why this puppy (Dow) is at this level is beyond me. Stagflation, rising interest rates, Home prices worst since the 30’s, US$ falling, etc., etc, and so on. My question is, “What is the good news?”. Not sure about Monday Sam. If Asia take it down then we could have another ‘January’ day…. this time Bernanke will not be coming to the rescue however! for all the good it did last time. representatives of several militant groups. been attacked, though the rebels denied their personnel were involved. extremely sensitive to any news of further disruption in Nigeria. just prior to the Nigerian plan have already started trading. have suspended both onshore and offshore production in recent weeks. has seen billions of dollars in oil revenues wasted. militia groups for political relevance,” Spio-Garbrah said. thuggery it won’t be invited to the summit, he added. Off subject – havin a Friday moment! MEND already say they will not attend that peace summit so I don’t see anything getting quelled. Scoop, I was just looking at something on Tuesday and commented there by accident. U.S. Gas rigs up 10 to 1514, near 20 year high of 1523 from last August. One of our vendors working the Haynesville for CHK said they are IP’ ~ 22MM and currently ~17MM (not sure how long on sales). Said that other operators are all of that too. Believe half of what you see, nothing what you hear. The guy is pretty competent and comes from that area, and already has my work. Wyoming – thanks. Makes me want to double my CHK July calls, add GDP, and HK julys and double my QBIK lottery ticket. Will you be fishing in Honduras? I don’t think I’ll have time but will squeeze it in if I can. Good Floyd Wilson interview on Mad Money. Think it aired last night. Can see on HK profile in Yahoo Fin. Z, Cheers to a great month! Buenas viajes! Wyoming. Check your email and did PVA ever say what they spent on their well? Z – Have a great time in Honduras. We will miss you! Thanks for the best wishes and likewise! I’m sure I’ll be jonesing for comments by Monday morning. NBR like the rig count data so it seems or maybe its just noise. PDS and UDRL particularly weak. No cost data, just the production. 1324 support on spx now becomes resistance. Suntrust providing some reassurance to the market. Have a safe and prosperous week. You are a good man helping others in need ZMAN. Thanks for the Bio Wyo! It’s on the tab. Wyo – that’s what I thought, best guess at costs on first well and 20th well by me $10 mm, $8 mm. Best to you too Ram. “This town needs an enema” or in this case I’d replace town with market. Probably right on costs, much deeper than Barnett Shale, fracs probably have ceramics. HS is probably more ductile than brittle (BS) and probably using xlink gel systems. All add costs to completions. Learning curve, increased competiton of vendors will probably get them to $8mm. Linear reservoir eng. 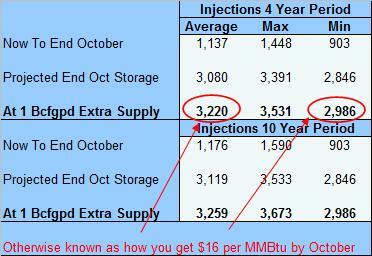 gets you to ~ 4BCF for ~20% ROI @ $10 gas …. they are all over this if those rates are correct. Thought you might pick up the All work quote. If you didn’t kill him, then who did, sir? petroleum complex helped boost prices. floor trade earlier in the day. attack on Iran’s nuclear facilities and disruptions in Nigerian production oil. “There are some warmer-than-normal temperatures forecast for the northern U.S.
temperatures that produced less cooling demand. There are two kinds of people my friend. Those with a rope around their neck, and those that do the cutting. There are two kinds of people in this world. Those with loaded guns, and those who dig. You dig. There are two kinds of spurs my friend. Those that come through the front door, and those that come through the window. ATN just [a few minutes ago] announced 4 Horizontal Gas Wells in the Chatanooga Shale [believe near Mnteagle, TN, IP flow rates are several hundred Kmcf per day. To the best of my nowedge these are the first Horizontal wells and imply to me discovery of a a new [deeper]fromation….they have 106,000 acres in the play and have a history of drilling shallow [low production] wells in East Tennessee………not a ‘barnburner’ like Haynesville, but certainly another new Sale play to keep our eyes on. This by the way is how I do research. Instead of having a point and looking for things to prove your case, why not look at all the pieces and see what they tell you? Thanks for the headsup Crys. ATN is an interesting trader. Looked at awhile back, did not bite, they have a slug of Marcellus if I’m remembering correctly so close to beer thirty on an expiry Friday. Will have a look. Bueno, Malo and el Feo!! Well done, Irish and Wyoming. Z- Zero effect? Not sure on this one. ATN – 10x 2009 CFPS estimates, (pricey) but they should have a pretty high R/P and production growth rate to back that up. Don’t like the option spreads for a quick trade but the chart looks poised to my neophytic technical eye to rally. Was hot a few weeks back and has been resting. Here are details of the ATN discovery, they so not give a depth, but the well cost [for a 3,000′ lateral Horizontal is’DIRT’….. or should I say Shale CHEAP @ $1.1million each], so my guess is the depth is less than 5,000’…but this is my speculation……..they are saying 750 well potential on their exising leasehold. See I fiugured ZMAN’s favorite movie had to be Texan, oil, The Duke=Hellfighters. Zero Effect never played in NY!! I don’t deserve to die. Deserv’in got nothing to do with it. I’ll see you in hell Will Money. Crys – almost certainly shallower than that, you can punch those quickly with a smaller rig to boot. Say they’re 0.5 Bcfe bumps apiece (pure spec on my part but should be on the side of conservatism) that’s a pretty low cost add of 200 B’s from the shale alone. The Hell Fighters and Grand Prix are in my top 10. People that put out oil fires; people that burn a lot of oil. Nah, Z’s favorite is “Starship Troopers” with the talented Denise Richards starring, LOL! Thanks for the cost info Wyo. Where they going to get all the water for these fracs, they’re talking some serious size on these, I mean if the play gets as hopping as everyone thinks doesn’t access to and then disposal of throw them a kink? I know CHK and SWN spent a fortune in the Fayetteville just handling water. Sambone does not lie. “Do you want to know more?” Thought about naming the site that, lol, then thought it sounded a bit pretentious. Have a safe trip Z.
Tini time, Everybody have a good weekend! Z – Keep it between the lines, keep the chalk off your shoes, have fun. We’ll be here when ya get back! If they are more conventional than slickwater, water required will be much less (brittle vs. ductile). Say about 20,000 bbl water per well (xlink frac) vs 90,000 bbl for slickwater. depends on # stages and many variables. Even said, costs to truck vs pits in Barnett is about $200k vs $50k with all of the tanks and right of way for pipes, xfer pumps. Oh dear. Volume indicates lower lows still ahead. Still looking for a low early next week and then a bounce. Water is peanuts compared to the rig costs, go NBR. The company we love and hate (operationally speaking). Will have the weekly wrap out in 30 minutes and that will be the place to post next week. I will be back June 29 and barring malaria/dysentery etc will post on Monday. Wyoming – thanks re water. Agreed go NBR. Got any first hand thoughts on UDRL? They seem like the uncoventional horizontal and underbalanced capable poster child. Z: Have fun next week. Scoop, Pop, Boss, Irish & Bob – muchas gracias! Have a great trip zman! Good weekend to all! We don’t use them, at least in our group. Mainly NBR and HnP. PTEN is looking interesting to us for some other applications. Without looking at the fundies, UDRL should be doing good. Drunk Monkey in this environment better manage a profit. Like I said earlier, factor rig rates about $26k per day, HHP does not matter. We are looking to add in H2 just like everyone else. On another note, buddy of mine says they are tight on pipe, mainly when the new year starts. They drill in the Fayetville. Thanks Italy for the bio. Gives Petra something to do before she gets a vacation from me. Wrap in 5 minutes. This will be where comments go for the next week.